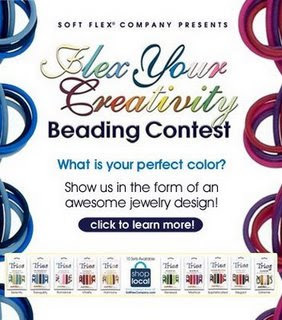 Soft Flex Company has really made some of my favorite flexible beading wire. Their new Trios are awesome! The colors, flexibility, and strength are GREAT! 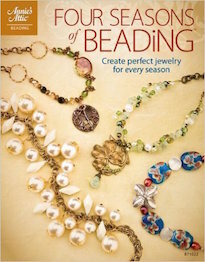 Did you know that they are having a beading competition? CLICK HERE for more information. So, I'm going back on the road again. This time our destination is the Philadelphia Bead Fest Wire show in King of Prussia. I can't wait! It should be a lot of fun. It's always nice to see the Green Girl Studios customers in the area, hang out with the Interweave bunch, and shopping from the great vendor line up. Please drop by and say hello! And don't forget to bring by the things you've made with our goodies; you'll get a free bead! After the show in Miami, we made our way back to Asheville. 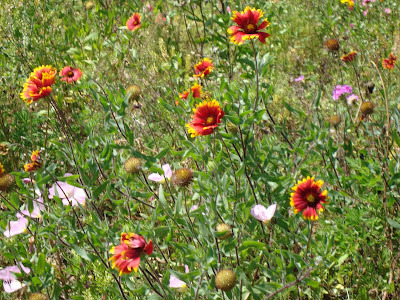 We drove through miles of road lined with brightly-colored wildflowers. We had to pick Greg up at the Greenville/Spartanburg airport and had a little bit of time to kill. While we were in Miami, we didn't get a chance to hit the beaches. Too much traffic kept us at bay. So we made a stop at a place we always remark on when we pass: Jekyll Island off the coast of Georgia. 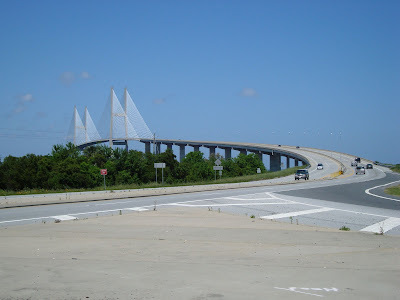 Above is a view of the Sidney Lanier bridge that one passes by on their way to Jekyll Island. We went over the bridge just to go over it. From the top of the bridge, you can see for miles, stretching over grasslands and coastal marshes. 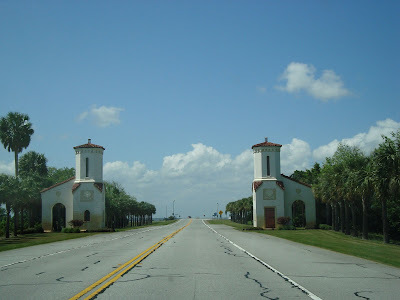 The entrance to the way to the island is marked with these two structures. The island was once exclusively a playground for the rich. However, the property was bought by the state of Georgia and was converted into a public treasure. Our excursion to the beach was just what I needed! A little sun did my heart much good. 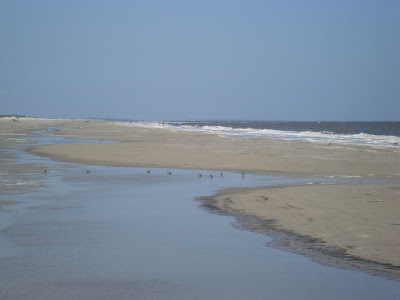 I enjoyed our walk along the beach, picking up seashells, and exploring this new place. Apparently Jekyll Island has a long history and is now home to exclusive beach resorts, sea turtle sanctuaries, and golf courses. 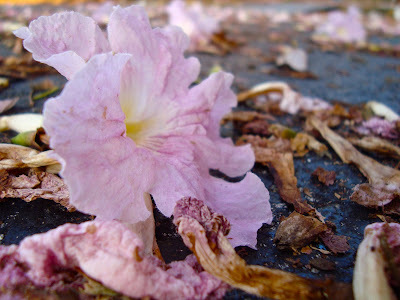 Above and to the left is a shot of Azalea on the boardwalk playing with a flower she found. To the right is a picture of her holding a conch we found. The waters were murky and brownish due to all the silt in the water, (probably from being near a tributary) which made it ideal for finding sea life. I found a sand-dollar and another conch shell. We had fun running through the sea foam and looking for tiny angel-wing calm shells. Although our trip to Jekyll Island was a short one, it was definitely a nice one. It was the perfect little breather. We were all happy to get out of the car for a little bit of fun in the sun. To the left is an image of the base of one of the sand dunes. 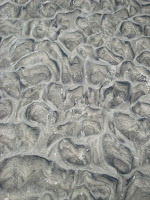 I took the picture, because I love the pattern that the sand creates, swirling and cratering. The van glided down the roads that wove through wetlands and grassy vistas. The old growth oaks stood like solitary sentinels, bearded with Spanish moss. 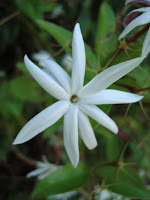 Along the roads we traveled palm trees swayed and flowers brightly studded the waysides. Orange groves formed orderly rows, neat and tidy. We kept our eyes peeled for gator sightings. We only saw two. This is the Florida I dream about. I dream about a sun-soaked land, both beautiful and dangerous. Above Left: Azalea styling my mom's hair. Above Right: Dad striking a pose. While we were in Miami for the Best Bead Show, our parents drove down to take advantage of our proximity, for my mom to scope out some beads, and to spend time with Azalea. It was good to see them. Azalea definitely had fun playing with Lula (what she calls my mom) and Lulu (what she calls my dad). It is nice to see how much Azalea likes to spend time with them. 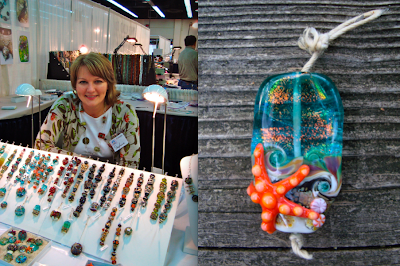 We had really great neighbors at the bead show. To our left was Lewis Wilson of Crystal Myths, to our right was Rare Gems International, and catty-corner to us were Stephanie Ann Dieleman and Kerri Fuhr. Not only are they wonderful people with a delightful sense of humor, but these Canadians are masterful glass beadmakers. 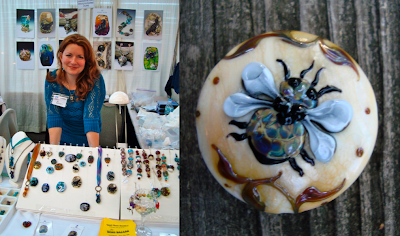 I adore Stephanie's ocean themed beads and Kerri's bees. You might remember Kerri's work from a spotlight I did on her raven bead HERE. The show was nice because we got to spend a lot of time catching up with the loyal Green Girl Studios customers and reconnecting with them. We always like seeing everyone and what they've been making. When people discover that my sisters and I all went to art school and that we are all creative in our day-to-day lives, they always ask if our parents are creative as well. Above are a sampling of jewelry designs that my mom made. I am deeply impressed with the work that she's making and am happy to say that the apple hasn't fallen far from the tree. It seems like forever since I've last posted. It's unusual for me to be gone from the blog so long, but I was on the road and opportunities to get on the internet were scarce. We stopped at my parents' house in Orlando on the way to the Best Bead Show in Miami. It was strange to be back after so long. I've been away for several years. It was strange to be back, seeing the forests I once ran through – now shopping malls. Old haunts and hang outs were now new businesses, unfamiliar and unknown to me. Being back, was like seeing an old lover after many years. While everyone was inside unpacking, I took a walk around my parents' property. 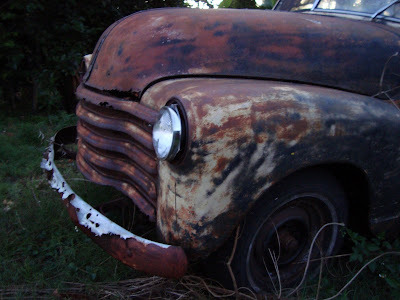 I saw the old rusted trucks my father one day intends to restore, I smelled the sticky-sweet fragrance of the night-blooming jasmine, and felt the wind on my face – that same wind with the faint smell of the salt of the sea even though miles from the ocean. I remember that wind, the one pushing me forward to where I am now, reminding me that the sunshine of my childhood still shines within me where ever I go. In a few hours we're jumping back on the road again. Cynthia, Azalea, and I are headed to Miami for the Best Bead Show this weekend, running from Friday to Sunday. We're making a brief stop at our parents' house in Orlando. It'll strange being back. I haven't been back in years, but it'll definitely be nice to see my parents and see what they've done with their house. Make sure to come out and visit us if you're in Miami or in the surrounding area! We'd love to see you and see what you've been working on. One of the great things about visiting Asheville is that sometimes I can arrange to meet up with one of my favorite designers and a very special soul, Nina Bagley. We all look forward to visits with Nina. She exudes warmth and creativity and we just have so much fun talking and laughing, and just having an all-around good time. Luckily we were able to meet up for an afternoon. The above pictures show Nina on the left, the heart stone that she gave me on her last visit in the center, and on the right what I did with the heart stone. Food is a very important thing for us. It's a way that we show we care and it's one of the things that brings us together. Not only that, but we love to try new things and try out different flavor combinations. Since I've gotten here, we've been feasting a lot! The above picture may look like just mashed potatoes and meatballs, but the mashed potatoes are made out of Japenese sweet potatoes. They have a purple skin and a white flesh and have a rich, buttery, nutty flavor that is perfectly accentuated with a little bit of cream. Inspired by a condiment made by a chef on the Food Network television show, Chopped, I made an onion gastrique with grape jelly and sliced onions. We've been working a lot, so I just threw together a quick stir-fry for dinner the other night. It was fast and tasted yummy. We haven't just been eating in. For lunch one day, we headed down to the Papa's & Beer for some excellent Mexican food. The torta is about as big as Cynthia's face, which made me laugh. Nina Bagley came over today and one of the little snacks we made for the visit was cinnamon and dark cocoa powder coated roasted almonds with brown sugar. They were the perfect little treat to go with our fresh squeezed juice and good company! While I was off on my relative radio-silence last week, I dropped by 3rdWard for a class with Max Goodman on photo etching! It was really exciting and brought back all kinds of memories of when I learned intaglio printing and the etching process several years ago. To the left are a few of the samples I made during the class. They're really simple and basic as it was a techniques class and it was the first time that they offered the course. The class was a lot of fun and I'm dreaming up all the many projects I'm going to make! Have you heard of the new Yudu home screen printing machine? Margot Potter has just uploaded a new tutorial video on how to operate this snazzy new contraption. Margot has really pushed the envelope on creating accessible online tutorials that promise never to bore. The current video is no different and done in traditional Impatient Crafter style : straight-forward, witty, and totally educational. Make sure to check it out, by CLICKING HERE. Puzzle piece jewelry is perfect to make during the month of April since it happens to be autism awareness month. 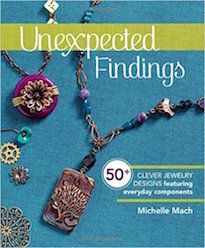 Here are a few projects to help you make your own puzzle piece jewelry. Worried about the economy? 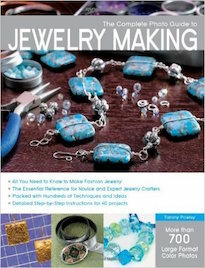 Take care of your bead business with these tips. Demos and more planned for the Bead&Button Show 2009. 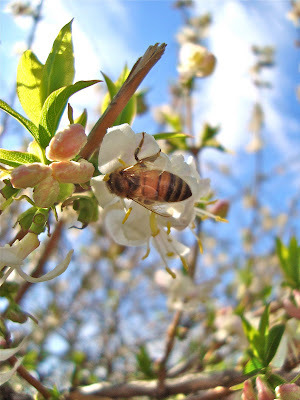 Marketing Monday: It's all about word of mouth! Mother's Day is coming fast! Do you need a project idea? Candie and Katie have just the thing! 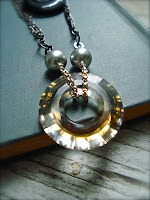 Carmi creates a punched fiber collage necklace. Make a fiber and wire necklace that will slide right on with no clasp! 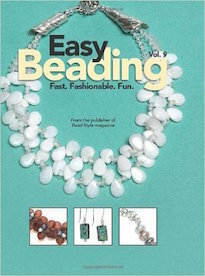 Jean reviews an excellent wire wrapping book, Beautiful Wire Jewelry for Beaders, by Irina Miech. Melissa shows off a new necklace design inspired by Sir Thomas Wyatt's poem "Whoso List to Hunt." Taking advantage of Artbeads.com's free shipping and fast, friendly service, Andrew attempts to capture the beauty of a Lord Byron poem with the new Crystallized - Swarovski Element Disk Pendants in his new necklace design, "Cloudless Climes". Yesterday was spent mostly traveling and waiting. My travels began early, as the sun was rising up over La Guardia Airport. From there, the trip is a blurry succession of images, hazed with sleepiness and the weariness of travel. Plane delays. Mechanical problems. Gate changes. You know you're desensitized to the woes of traveling when those things don't even sink in anymore and you're just sort of float along like a leaf caught up in the rushing waters of a stream. I am here now in Asheville and already the feasting has begun! It is good to be with my family. Azalea is being super sweet and she's very excited about the new baby on the way. Cynthia is just finishing up work on the book. (I'm trying to encourage her to write part two and part one isn't even released yet!) But that's because I think the book is just that good. I wouldn't say that if I didn't think so. It's definitely good to be here. 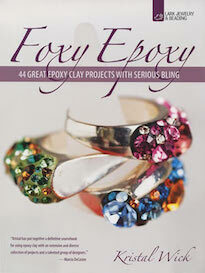 In a few days we're going to meet up with Nina Bagley for a crafting and feasting extravaganza! I can't wait! We're also going to Florida. It'll be strange to go back. I haven't been in several years. We're going to visit my parents on the way down to Miami for the Best Bead show. It looks like it'll be a really good show. Make sure to drop by to say hello! And do wear your Green Girl Studios jewelry, as you'll get a free bead for representing. When I saw the new Crystallized - Swarovski Elements disk pendants, I was instantly reminded of the poem by Lord Byron. Perhaps it was the fact that these new disk pendants, with their precision-cut facets, have a unique quality of both absorbing and reflecting light. I first saw them at their debut of the new Crystallized - Swarovski Element line in Tucson and I knew I had to work with them. I was reminded of this need to utilize their versatile shape and brilliant sparkle at a recent visit to Artbeads.com, a great resource for jewelry supplies and Swarovski crystal beads. This little trip produced the two used in the design featured above – one in jet and the other in crystal silver shade. CLICK HERE to visit their site and peruse their selection. I think that the color palette perfectly embodies Lord Byron's poem. Needless to say, I was inspired and challenged to create a piece that would capture the essence of the poem. 1. Use 2" of wire to create a wire-wrapped link, attaching 1 half of the toggle to 3" of gunmetal chain, strung with 1 dark indigo 8mm round. Form another wire-wrapped link (using 2" of wire), connecting the gunmetal chain to 3" of jet cuplink chain, strung with 1 light grey pearl. Attach the end of the cuplink chain to another 3" length of gunmetal chain with a wire-wrapped link strung with 1 dark indigo 8mm round. 2. Cut 1" of silver 2mm rollo chain. Use 2" of wire to create another wire-wrapped link strung with 1 light grey pearl. Connect the gunmetal chain to both ends of the rollo chain, creating a chain loop to hold 1 crystal silver shade 25mm disk pendant. 3. Repeat Steps 1 and 2 for the other half of the necklace. 4. Cut 1" of silver 2mm rollo chain. Find the middle 9x6mm link in the top of the bottommost length of gunmetal chain. Use 1.5" of wire to create a wire-wrapped link, strung with 1 crystal silver shade 4mm bicone, to connect the 9x6 gunmetal link with the both ends of the rollo chain, used as a chain loop to hold 1 jet 25mm disk pendant. Repeat for the other side. What I love about this design is that it has a lot of movement. The disks act almost as pendulums that pick up the wearer's movements, amplifying their individual rhythms and motions – creating thousands of tiny twinkles of cloudless climes and starry skies. 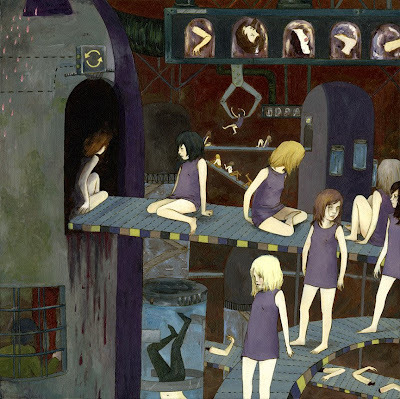 Above: "The Perfect Bot" by Jen Tong. I have been in the process of decompressing after quite a few deadlines and a lot of work. For the past few weeks I've been squirreled away working and have not really been able to take much time for myself. One of the things that I do to get me to feel more myself again is to spend time with the people I love. Today, I was fortunate enough to have lunch with the talented Jen Tong. I made pork chops with sliced pears cooked in garlic, butter, and white wine, biscuits, and creamy garlic mashed potatoes. For dessert, I made an apple crisp. It was really good to sit down and catch up with her. Her show out in San Francisco, Sweet Surrender, did amazingly well and her "Femme Bot" paintings were received warmly! CLICK HERE to check out one of the recent write-ups of her work. 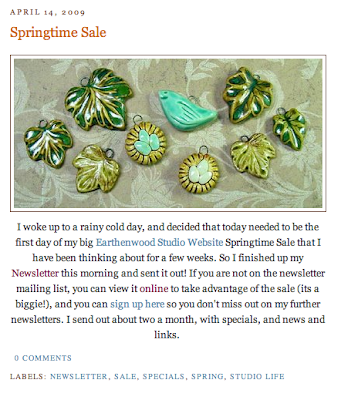 Melanie of Earthenwood Studio just posted a springtime sale on her porcelain and ceramic goods! Hurry up and take advantage of her sale and snap up some of her goodies! CLICK HERE to sign up for her newsletter (and be in the first to know about future sales, updates, and news) and CLICK HERE to visit the sale page to see how you can save on your next order! A bright light shines. It whispers, "You are almost finished. You are almost finished!" The light seems far away now, but it will rise with the morning sun and then I will be done. The words grow louder in my mind. "You are almost finished!" I am giddy with the prospect of turning my attention away from counting, measuring, and configuring. Just a little bit more and I'll make something sloppy and messy without directions, instructions, or exact amounts. I'll go for a walk and not feel guilty that I should be starring at the computer, shifting through seas of red and notes to self. I will sip my coffee slowly, enjoying the flavor and aroma and not gulp it down out of necessity, urging my body and mind to keep going, going, GOING! A bright light shines and it squeals with joy, "YOU ARE ALMOST FINISHED!" Speaking of 'wichcraft, Sisha and Tom just came out with a cookbook that shares in some of the secrets and magic that go into creating the foundations of a successful restaurant chain. I think it's safe to say that I can give at least partial credit to my love affair with food to the things I've tasted and learned in the kitchens at 'wichcraft. Their dedication to quality and passion for food is infectious and I've well and truly caught the foodie fever! 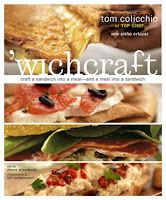 The new cookbook is aptly called, 'wichcraft: Craft a sandwich into a meal – and a meal into a sandwich. The book is simply delicious! The step-by-step recipes and photography are rich and mouthwatering. So much so, that Gourmet magazine has selected to feature it as their book of the month for the month of April. 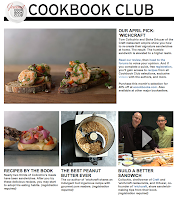 CLICK HERE to visit Gourmet magazine's online supplementary materials including video tutorials and tasty recipes from the book! In lieu of the holiday (or rather an excuse to leave the house and allow my eyes to adjust to actual daylight), I extricated myself from the salt mines and we made our way over to Jenny and Sisha's apartment for Easter Dinner. Above: A few of the springtime dishes served – morel mushroom pasta, ramps, fingerling potatoes, asparagus, and lamb. Above: Artist, Steve Ellis, ceremonially beheads the chocolate bunny. Dismembered chocolate bunny was served along with a flourless chocolate cake and a lemon curd and blackberry jam cake that Jenny made with candied flowers and homemade buttercream frosting, and my humble rum cake. Oy, my aching back! Tammy is de-stashing her jewelry and other craft supplies while on spring break. Here are de-stashing tips and places that need your jewelry supply orphans. This month's challenge is Botticelli's Birth of Venus. Barbe talks about riveting and finding the right size drill bits. 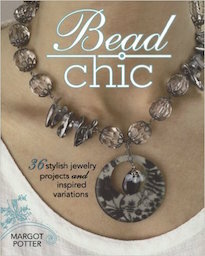 Julia Gerlach talks about bead patterns and gifts. A splendid night out at the Smart Shop metal-smithing studio's gallery crawl inspires Melanie. Carmi sews a few hooked flowers and beads to create a jacket corsage. 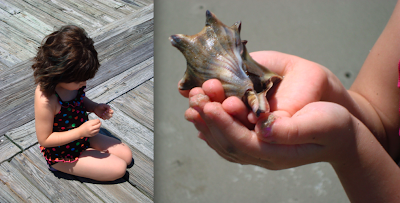 Think that shell jewelry is just for kids? 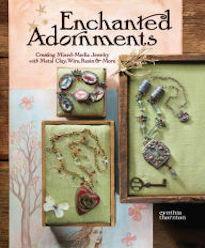 Take a look at Karen Sugarman's designs and I guarantee you'll change your mind! Check out Katie's fun and flowery spring inspiration! April is Autism Awareness Month. Express yourself creatively! A new, double-sided sugar skull pendant from Anne Choi inspires Andrew to create this new bracelet. I have a weakness for comfort food, especially slow-cooked meals. There's a magic in cooking something on a low temperature for hours and hours. The flavors soak in so deeply and the texture becomes soft and buttery. One of my favorite meals to make is slow-cooked beef. The most important ingredient for a successful batch is TIME. Now that I work from home, the slow-cooker can be going all day (and night) without anything to worry about. The only thing is that the aroma is utterly mouthwatering and can be a little distracting. I generally serve the slow-cooked beef over egg noodles or soft-cooked polenta. I was so inspired by Anne Choi's new sugar skull pendant that I whipped up this quick bracelet. I pulled the main color palette from Pam Wynn of Pam and Heather Wynn's polymer beads – turquoise and copper. The bone and ceramic skulls were presents from Margot Potter, but you can pick them up from Anima Designs if you don't have a good friend with excess skull beads. The Czech glass is from Raven's Journey and the pearls are from Talisman Associates Inc.. I used a fine pewter sugar skull bead from my family at Green Girl Studios, a bronze skull cross from Candice Wakumoto, and the sterling silver toggle from Saki Silver. 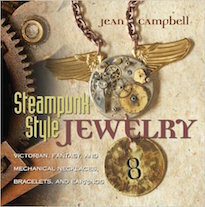 The knurled peanut chain is from Ornamentea. The Swarovski crystals in crystal copper and satin indicolite are from Fusion Beads. I think this bracelet is a lot of fun! It's surprisingly light for how chunky it is and has a lot of movement. I've been working so much that my eyes are starting to cross. As a way of treating myself and rewarding myself for all the work I've been doing recently, I picked up Anne Choi's latest mandrake bead! I adore her mandrake beads. This one reminds me of St. Sebastian. It has a Theodore Roethke quote on it that reads, "Truth never is undone, its shafts remain." 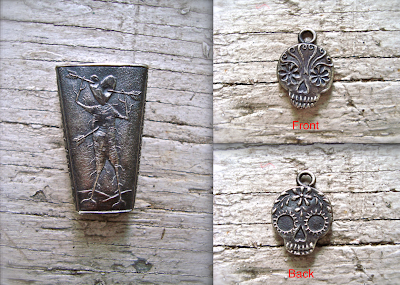 She also included a preview of her new line – a two-sided sugar skull pendant. Anne Choi is supremely talented and creates little works of art that bring me so much happiness. On particularly rough days, I take them out and go through my collection, reading the messages, remembering stories, and looking at and feeling the richly detailed carving – this relaxes me and puts me in a happy place. This is one of the vintage postcards I picked up at the Super Flea Market extravaganza down the block this past weekend. Isn't it charming? 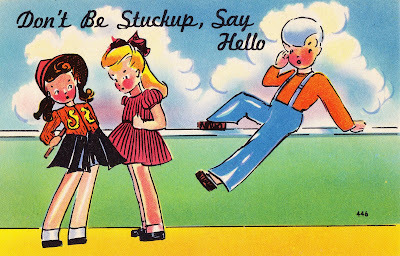 The postcard may be vintage, but the sentiment still applies. Today the sun was out and the sky was bright blue – it was warm, balmy, and a perfect day for walking around and exploring. By happenstance, we passed by Our Lady of Perpetual Help and guess what was there? A SUPER Flea Market! It did my heart good to see it after yesterday's debacle. The Super Flea Market had rows of vendors of various kinds and a bake sale with $0.25 goods. Needless to say, I had to appease my sweet-tooth and load up on baked goods. I also found some vintage postcards. Walking around with only a vague notion of where we were going, we found ourselves at the American Veterans Memorial Pier in Bay Ridge. The scent of sea and salt was strong on the air. It was a nice spot to people watch and enjoy some of those baked goods. After we finished up enjoying the beaming sun and the sounds of waves crashing against the stones at the pier, we went to Narrows Botanical Gardens. It was a cute little park (not far from the pier) with lots of little placards and flora in bloom. I never would have thought that seeing plants and getting a little fresh air would be so important to me, but these simple acts did much to recharge my soul. I hadn't even realized how tired and in need of a little outdoors I was. On the way back to the apartment, we stopped at another park called, Owl's Head Park. I could not resist stopping at a place with "owl" in the name. It was good to tromp around and see some open sky. It was good to hear children laughing and birds cooing, chirping, and cheeping. I think the above picture is one of my favorite pictures taken from the day. It almost looks like the movie poster from Big Fish. To me it looked like a nice quiet place, solitary in the clearing. Upon closer inspecting, the bark revealed names and dates of countless people carved in the soft bark. It made me think of how people are not so different. Everyone has a tracery of names scratched in their heart, some worn on the sleeve and others hidden in the highest branches. Walking so much in the nice warm weather worked up a thirst! From Owl's Head Park, we wandered around Bay Ridge, making mental notes of places to come back and visit and potential places to stop. Finally we settled on Omonia Cafe, a cute little Greek place with a mega selection of desserts and pastries. I had a visinada, which is kind of like a sour cherry Italian soda, and a creme caramel. Both were delicious! It was a good day today. It felt as though all the little disappointments from yesterday were some how resolved and redone, transformed into a beautiful day in the sun.